A Color Riche liquid lipstick from L’Oreal Paris to make your lips fuller and plumper. They are long stay with rich pigmentation which are formulated with micro oils. The Extraordinaire formula provides the perfect color balance and care for your precious lips. The lipstick applicator helps you to achieve the perfect fuller lips. 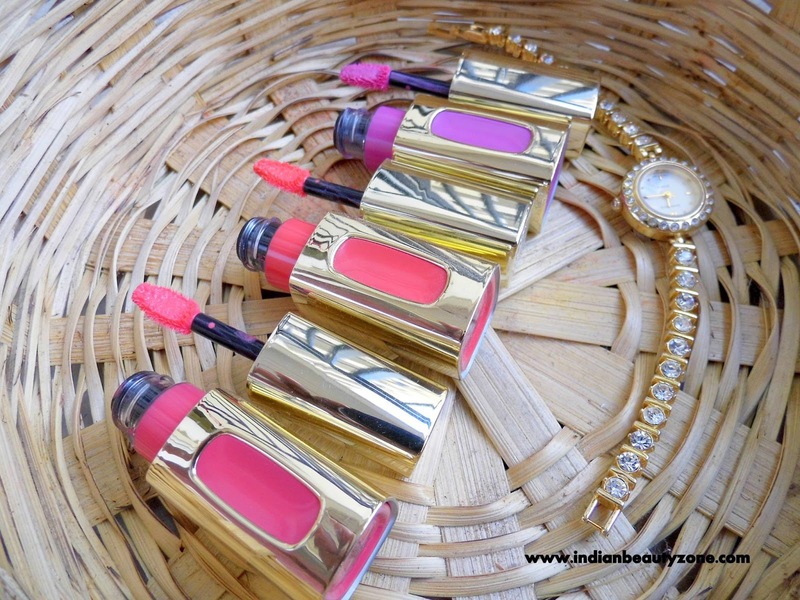 All these Cannes collections are comes in a pretty golden packaging, so this liquid lipstick also comes in a beautiful golden package and the shade of the lipstick visible in a transparent gap in the packaging. The packaging has a screw open lid with a leaf like applicator. It is travel friendly. The liquid lipsticks have a nice and smooth texture with creamy formula, so you can apply it evenly on your lips without any struggle. The shades here I am reviewing are Coral Encore, Rose Symphony and Plum Quartet. All these shade are very pretty and looking very good on the medium skin tone. 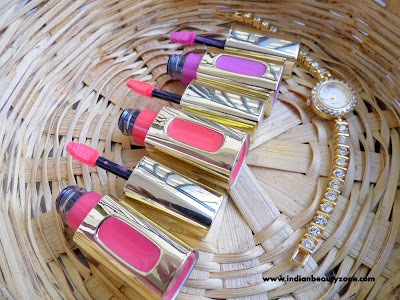 These shades will suits most of the Indian skin tones, the Coral Encore and the Rose Symphony shades are daily wearable. If you have less pigmented lips these lipsticks will look more pretty on your lips within a single swipe and if you have pigmented lips then you need 2 to 3 swipes to get covered well. Regarding pigmentation of these liquid lipsticks they are well pigmented and gives a good colour payoff on your lips when applied. Personally I love the Coral Encore shade very much, it is a pretty pink shade with coral hints. It suits very well for my medium skin tone. It is a daily wearable shade. The Rose Symphony and the Plum Quartet shades also looks good. Rose Symphony is also a coral shade with dark pink hints and he Plum Quartet is a violet based pink shade, this will suits for cool undertone people well. The lipstick stays for more than 6 hours with light meals and snacks. Later it leaves a beautiful tint on your lips. Only thing to note with these lipsticks is you have to exfoliate your lips well, because it is a liquid lipstick and it needs an even surface to spread without any streaks. I love the creamy formula that makes the lips fuller and shinier with an opaque finish that you will love the most from your lips. These lipsticks are worth for the price. This is a budget option for those who want to try high end good quality lipsticks. Most of the shades suits for Indian skin tones. If you have very pigmented lips you will need several swipes. You need to exfoliate well before applying. 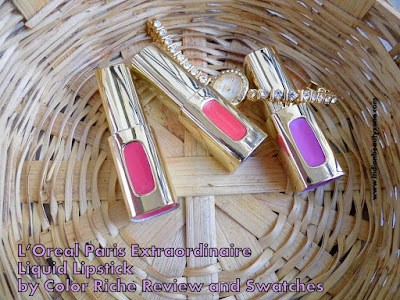 L’Oreal Paris Extraordinaire Liquid Lipstick by Color Riche are really good lipsticks and those who wants shinier and fuller lips with opaque finish should go for this lipstick. They are really awesome and with good shade collection to choose, they have some daily wear neutral shades too.